How are Anchors added to lists? In order to have anchor bolts in lists we need to add them to the report contents that the template is using. For this, we need to add a content called "Tie Bolts" to the list in which the anchor bolts are required. 1. In the BOM editor, browse to the list you want to modify. 2. 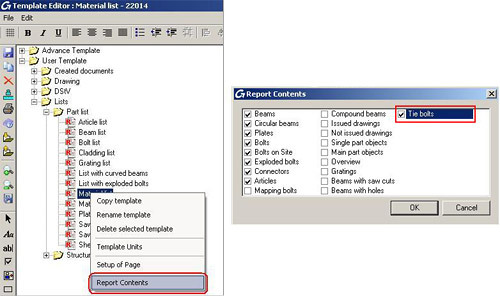 Right click, for example, on "Material List" - "Report Contents". 3. In the "Report Contents" window, check "Tie bolts". 4. Click OK and save the template.